What do a chili parlor, an Italian family restaurant, and a burger joint have in common? For one thing, they’ve all beat the odds. According to USA Today, only 20% of new small businesses survive past one year. Yet, Cincinnati is home to dozens of beloved restaurants that have served generations of residents. The longevity of any business is testimony to its value, but independent neighborhood restaurants provide a stability that extends beyond their doors. After decades of operation, a neighborhood restaurant can anchor the economy and culture of a community and become a home away from home for neighbors, strangers, and friends. Price Hill Chili stands prominently along a busy stretch of Glenway Ave in West Price Hill. It opens early, closes late, and offers everything from breakfast at the diner counter to late-night cocktails in its bar and lounge. Price Hill Chili is the quintessential Cincinnati chili parlor, with hints of its history visible in the photographs lining the walls. 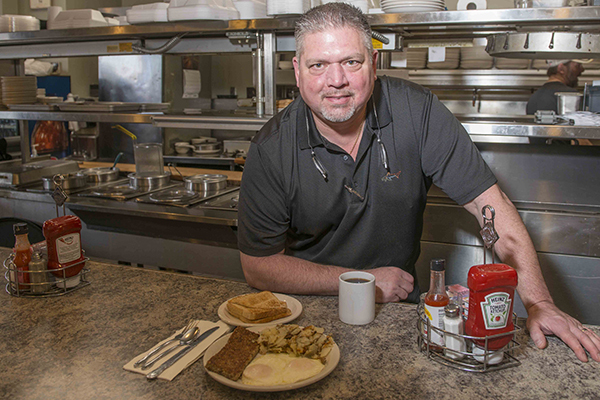 Owner Steve Beltsos grew up underfoot of his grandfather who was the restaurant’s original owner when it opened in 1962. Originally a small storefront diner, the restaurant has expanded a few times. 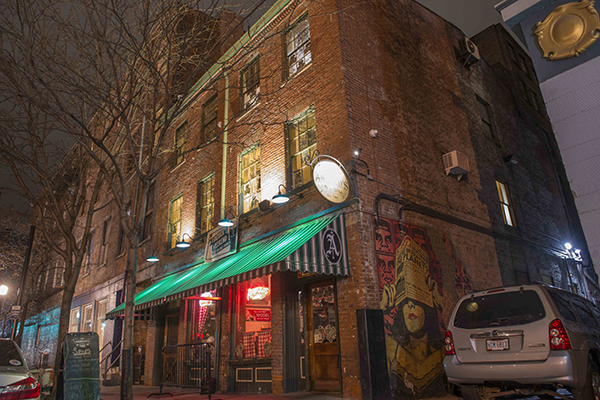 In a few short years, it took over the bar at the end of the block and donned it the Golden Fleece Lounge, staking its claim over the entire block. Beltsos now has between 80-90 employees, including his four children. Steve Beltsos mixes a fresh batch of chili in Price Hill.It’s been a family operation since the very beginning and that means Beltsos has his hands in every part of the operation, from waiting tables and bartending to mixing up the chili. What’s in the chili? Beltsos won’t tell. “We don’t give that up easily,” he says with a friendly smirk. This is especially true on game night when neighbors gather in the lounge to watch Xavier and University of Cincinnati ball games. Both teams have a following and the walls are decorated in homage to multiple neighborhood and city teams. There has been a weekly March Madness meet-up there for 20 years and the place has connections to three NFL players. What keeps customers coming back to Price Hill Chili? Beltsos thinks its the personal service. “We know a lot of our customers on a first-name basis,” he explains. And it’s always been that way. “We’ve had generations of regulars,” he says, coming in for everything from family parties to high school class lunches. Newport, Kentucky’s history conjures images of gangsters, Tommy Guns, Prohibition speakeasies, and movie stars. Pompilio’s Restaurant has been there to see it all. At the turn of the 20th Century, a saloon opened near a trolley stop at the corner of Washington Avenue and 6th Street. It was a partnership bar with nearby Wiedemann Brewing , open almost around the clock for the blue-collar workers going to and from work. It served booze all day, with breakfast, lunch, and dinner. In February of 1922, it was famously raided by the Kentucky National Guard and the Federal police for operating during Prohibition. The Pompilio family took over the business in 1933 and began serving family-style Italian fare to the hungry working class. According to legend, during this era, Pompilio’s was also frequented by the likes of Marilyn Monroe and Frank Sinatra, along with other performers from the nearby Beverly Hills Supper Club. 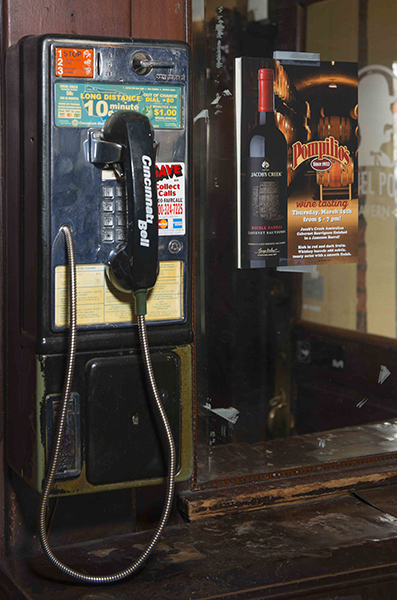 Pompilio's payphone used in "Rain Man"In 1982, the Mazzei family bought Pompilio’s and kept the name. Then, in 1987, Newport got a boost when the Greater Cincinnati Film Commission brought the film Rain Man to the city and filmed an iconic scene in Pompilios’ dining room. The city was now on the map and Pompilio’s received an onslaught of attention locally and nationally. Since it’s original opening, Pompilio’s building has been renovated a few times and has expanded into adjacent lots. It now hosts a larger space for private events and live music, plus a back patio with a pair of bocce courts that have hosted 50 bocce teams since 1991. The prep kitchen upstairs is where the chefs make the same lasagna and ravioli they’ve made since the beginning. In 2011, three friends — Mike Mazzei, Joe Bristow, and Larry Geiger — bought the business from Mazzei’s family. Rather than reinventing the restaurant for a new generation, they are riffing off the things that have kept Pompilio’s alive this long--things like like a great selection of bourbon and local beer, good family food, and their family recipe sauce. 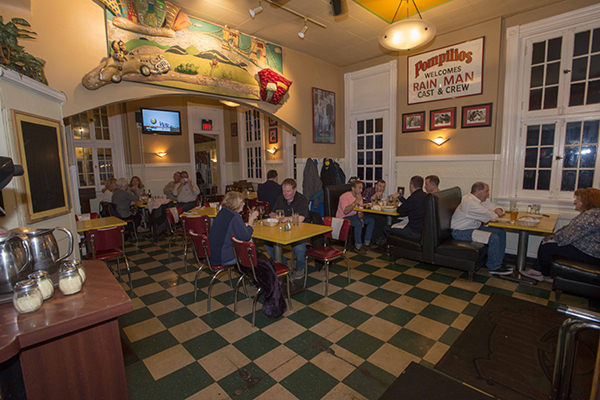 On April 1, Pompilios celebrated their 85th Anniversary. How have they lasted so long? Co-owner Geiger believes that, over the years, customers have come to depend on Pompilio’s consistency. Geiger was born and raised in Newport though he moved away for a time. When given the opportunity to move back and buy into Pompilio’s with his friends, he couldn’t pass up the chance. The draw, he says, was the rich history of such an iconic restaurant and the family atmosphere — and a love for the food, of course. 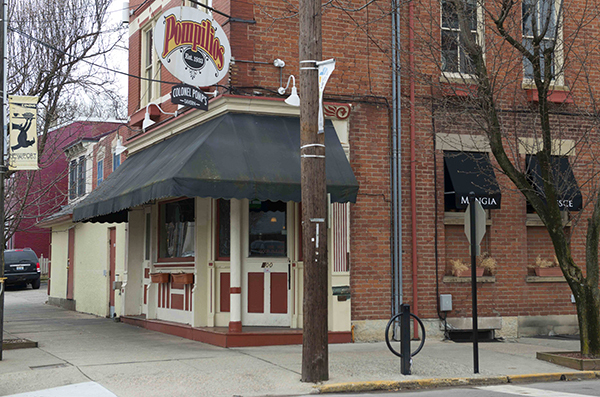 Pompilio’s is now a regional destination, but Geiger says they still depend on the support of Newport and Cincinnati residents to keep them open and in business. Susan Selzer is one of the owners of Hyde Park favorite Arthur’s Cafe. Though she’s not related to its original owners by blood, her relationship with the restaurant goes back in the 1980’s when, fresh out of college, she started as a server and then moved to management. She left town for a few years and then came back to work part-time. The restaurant opened on Hyde Park’s busy Edwards Road in 1947 as the Allen E. Bradford Restaurant. 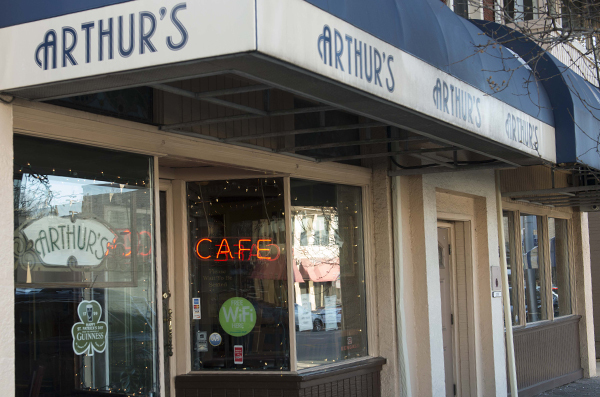 The name changed to Arthur’s Cafe in the 1970s. That’s when this “neighborhood legend” was born. When Selzer and her partners BJ Hughes and Joe Santorelli bought the place in 1998, things did not change much. Apart from some menu changes and updates to the building, it was already “a pretty well-run machine,” Selzer says. In the time since, they have opened a second location in Anderson (in 2014) and have considered expanding into a third. Arthur's Chipotle BBQ BurgerShe attributes their success to simple things — friendly and well-trained staff, good draft beer, private ownership, and reasonable prices. Arthur’s “Burger Madness” is a big draw, as well. 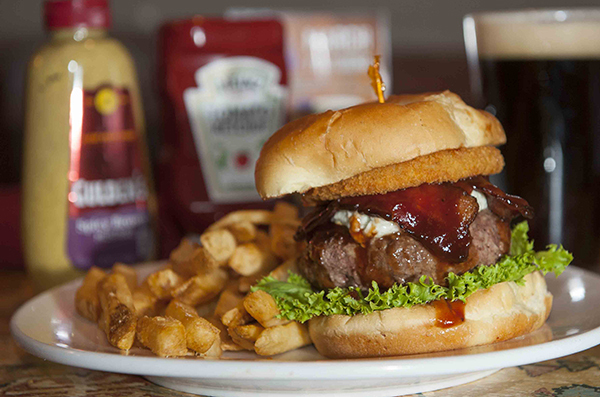 Three nights a week, customers can load up a custom burger, with fries, for only $8.99. The main attraction in Arthur’s barroom is a wall-sized mural of local “celebrities.” The mural was started in 1981 and the final caricatures were added in over twenty years ago. The mural captures the spirit of an era in Hyde Park and Cincinnati history and it’s not unusual for Selzer to have a customer walk in and point out their face — or more likely, their parent’s or grandparent’s face — on the wall. Arthur’s is one of a handful of eateries in the popular Hyde Park Square which means constant competition. Selzer isn’t worried. People keep coming back because the restaurant is just plain comfortable, she says. 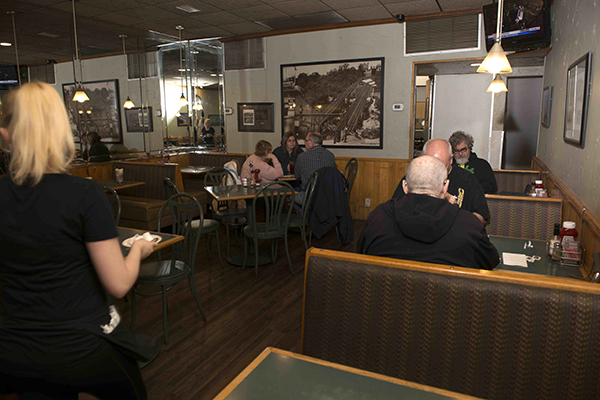 “You don’t have to get all dressed up.” Customers and staff are like family and, for Selzer and her co-owners, Arthur’s is like home. Are you looking to experience more of Cincinnati’s hometown restaurants? In the Central Business District visit Arnold’s Bar And Grill (pictured above) or Hathaway’s Diner. 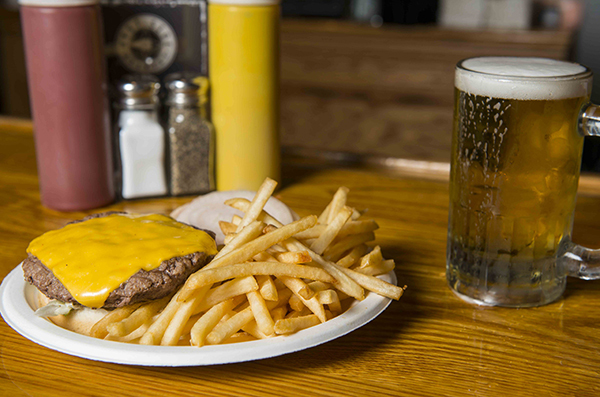 A classic cheeseburger, fries and a beer at Quatman CaféThen drive up to Corryville to visit Mecklenburg Gardens. Just northeast of downtown, try Quatman Café in Norwood or Sugar ‘n Spice in Paddock Hills. If you find yourself on the west side, give Stone's Restaurant or Maury's Tiny Cove in Cheviot a visit.